With colder weather fast approaching, daylight is starting to slip away. Pet visibility can start to become a problem during evening walks. 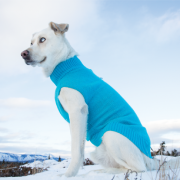 Thankfully, RC Pets’ Polaris Sweater, winner of best new product at our Western Canada Pet Industry Trade Show, is here to help. The highly reflective yarn creates maximum visibility at night. The sweater is a perfect mid-weight option for your furry friend that is sure to keep them safe in the dark. Jill Connolly, Creative Director at RC Pets, gave us some insight into the company and the award winning Polaris Sweater. How long has The Polaris Sweater been on the market? The Polaris Sweater was first launched to our retailers in February 2018, but as a fall/winter product it has only been available in stores since August 2018. What was the inspiration behind The Polaris Sweater? At RC Pets we are always looking to combine fashion and function. When looking to expand our sweater offering our design team explored various ways to add functional design elements to the program. In seeing some of the innovations being used in outerwear for the ski/snowboard industry we came across a unique reflective yarn that had been used for toques. After testing a few different versions we were able to find a highly reflective yarn that could be knit with our signature sweater yarn to create the Polaris Sweater. 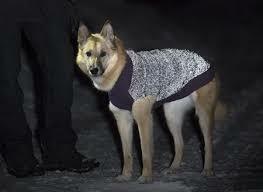 What benefits does The Polaris Sweater offer that other dog sweaters do not? The main benefit of the Polaris Sweater is the highly reflective yarn that is knit throughout the body keeping your dog warm and highly visible on the cold , dark walks so common in Canada. Additionally, most dog sweaters on the market only provide collar access, while the 2 way back zipper on the Polaris not only allows for harness access, but also means the sweater is easy to get on and off. The Polaris Sweater also features an exclusive eyelet logo label on the back hem that provides an attachment point for our newly launched Poppin’ Light. Use the Polaris Sweater and Poppin’ Light together for maximum visibility on your walks. Best of all it’s still machine washable. What do customers have to say about The Polaris Sweater? Where can The Polaris Sweater be purchased? The Polaris Sweater is available at pet specialty stores across Canada. If you are a retail store looking to carry this product you can reach out to us directly at csr@rcpets.com. Congratulations to RC Pets on their Best New Product Win, and thank you to everyone who took the time to vote! What is Habitattitude? September Certified!